Whilst the coppice was down we also took the opportunity to pollard the Alder along the southern edge of the area. These trees were planted as a nitrogen-fixing shelter belt- but they had grown so tall and had thinned out so that the wind whistled through the lower branches and the canopy was shading the coppice. By pollarding them, and hoping for them to re-grow lower down, we will be re-instating the shelter but without the shading aspect. The timber from these trees has already been split and stacked to dry and will make high quality firewood for next winter. You might also notice walking around this area that the willow that was around the central chestnut area has been coppiced too. The rods that will re-grow from these will now be cut annually and will provide basketry and hurdle materials, or will be bundled into faggots to fire our bread oven. After managing to secure a grant for hedgerow restoration and hedge-laying last year, we also embarked upon a lot of hedgelaying amongst the winter work this year. Many of the hedges here were planted with this in mind and we laid them West of England style with stakes and binders supplied from the coppice. The laying itself is a pleasure to do. The more tedious bit was the removal and re-instatement of the fences on either side of the hedge. 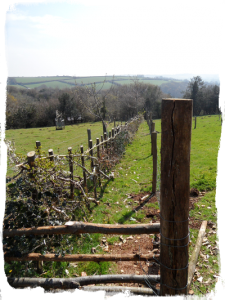 As part of the requirement of the grant we had to make sure the fences were at least 1.2metres from the centre of the hedge… it did however give us the opportunity to replace failing tanalised fence stakes with cleft chestnut ones (unfortunately not yet from our own coppice). The ‘Ash slope’ was planted mostly as ash coppice about 12 years ago. The intention was to sustainably harvest wood for furntiture, tool handles, firewood and charcoal. We are looking at this as an opportunity to experiment with silvopasture, the combination of grazing and forestry. As a start, we have felled and extracted an area of ash near the roundhouse and planted a mix of Hazel, Oak, Whitebeam, Cherry, Willow, Poplar and Douglas Fir. We will replant the rest of the slope over the next few years with a diverse mix of trees. As those trees grow, we will pollard many of them (cutting them at around head height) on a regular rotation like the rest of the coppice. We will harvest a mix of basketry materials, fodder and tree hay for animals, kindling, firewood, weavers for wattle hurdles and many other things from these pollards. 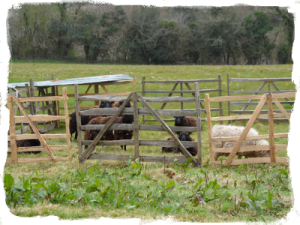 Underneath the pollarded trees, we will graze our sheep in a style often called “management intensive rotational grazing”, moving them little and often to benefit both the pasture and sheep. Over time, the slope should develop more diversity of structure and species and become a more resilient, productive and beautiful part of the land here. Having just finished removing the last of many thousands of tree shelters from earlier planting, we are reluctant to put too much more polluting plastic back onto the slope. 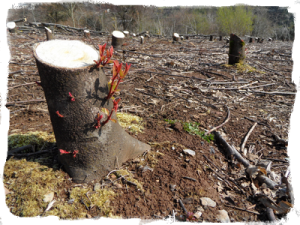 Because of this, we are experimenting with using very few tree shelters and encouraging brambles to protect the natural regeneration and replanting from rabbits and deer. If you notice that the slope looks untidy and chaotic at times, this is the reason why. We will monitor it closely and intervene if the brash and brambles choke the trees more than they protect them during the establishment phase. The sheep have just started a new regime where they are in a fairly small enclosure and being moved two or three times a day. This gives us a lot of flexibility about where they can graze, benefits the grass and the sheep, and means they become more used to human interaction which will help come shearing time and when we need to work with them in other ways. We have been making lots of chestnut gate hurdles to make this possible, and have refined the design and now pin the timbers together with oak pegs instead of very expensive copper nails… they are incredibly versatile and beautiful too! In the next month or so we are getting two new Ewe lambs and these are a milk breed. The plan is to grow them on through the year and then put them to the Ram in the Autumn. If all goes well they will lamb next spring, and we will start to milk them alongside them feeding their lambs. Tim plans to practice cheese making before then so at the peak of the yield we can be making stores for the half of the year when they will not produce milk… Watch this space! 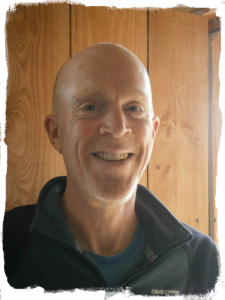 Anthony has been teaching Ki-Aikido for a little over a year, and is still looking for new students. On May 4th (no jedi jokes being used here) he will be having a free drop-in taster event to give anyone interested a chance to look at Ki-development, ki testing and Aikido. If you are interested just pop along to the Liskerrett centre, Varley lane, Liskeard, PL14 4AP any time between 11am and 2pm to chat with Anthony (1st Dan), Mel (3rd Dan), Ian (Green belt) or Alex (White belt). The weekly lessons are on a Wednesday evening from 7.30pm to 9.30pm at Liskerrett, cost just £7 and new students are welcome at any point- there is no requirement to start at a particular time of year as lessons are in no particular sequence. Within us all is a singular point of calm. Here we find we are relaxed, clear and sharp and time seems to expand allowing considered actions to follow. In this state we are strong, resilient and flexible and can allow ourselves to invest fully in our endeavours. This place is our ‘one point’ and the result of finding it is the co-ordination of mind and body. Ki-Aikido is a fun and compelling way to help us understand and develop the one point through specific practice and dynamic exercise. It can be practised by anyone willing to learn, of any age, size, ability or gender. Rather than fear, violence and hate, we learn calmness, tolerance and respect. Ki-Aikido is the Art of Peace. As part of national Dying Matters week, Pentiddy Natural Burials and Confortia are offering a Dying Matters day here at Pentiddy on Sunday 19th May 2019, 11am – 3pm. The day will be an opportunity for us to explore together our choices around death and dying with the hope of bringing death back into the heart of our communities and empowering us to make the most of our (finite) lives. View (download and share) the poster here. Six years ago I spent one glorious Summer doing an apprenticeship at a bakery in the woods near Wellington in Somerset. Since then I have dreamt about building my own wood-fired oven and sharing my love of sourdough. While I have the skills to make the sourdough my building skills fall into a very different category. So I am looking for people with building skills and experience to help me convert a field shelter on my off-grid smallholding into a bakehouse along the lines of a crowdfunding campaign, I am offering all-you-can-eat sourdough in return for helping me with the build/conversion. I could also offer some training in sourdough making for any budding dough-heads. So come on and help me make my dream into a reality. Lee lives near Liskeard on his off-grid smallholding which he shares with his cat Jelly, and lots of hens and ducks. Contact him on 07563 542274 if you are interested. We have been advertising as far and wide as possible the opportunity for the next internship which will start in October. We have had a flurry of interest and have had telephone/skype interviews with some applicants already. If you know of anyone who might be interested, or indeed have a channel to advertise this opportunity we would love to hear from you. More information available at www.pentiddy.co.uk/internship. Over the last couple of years many aspects of our project have started to show the fruits of our efforts. From this point onwards each year should see an increase in diversity of products and an increase in the quality too. The list below should give you an idea of what we will expect from the land here. We are pretty rubbish at marketing, so this is a little start at trying to let people know what’s available. Markets for these products is our next challenge… please get in touch if you can help. Firewood- Alder, Ash and Chestnut. Charcoal- for those summer barbecues. Bio-char- as a soil improver. Hazel poles- for hurdles, beanpoles, pea sticks, benders etc. Chestnut poles- for fence stakes, hedge stakes, furniture. Willow rods- for basketry, living willow structures and oven faggots. Previous PostCommunity Woodland March 2019 workday cancelled.